We are getting ready for the Indie Craft Experience in Atlanta this year! As always, it has a long list of talented crafters this year! I can’t wait. Raoul and I will be there for sure, so please come say hi and ask us about the Church if Craft in Athens! 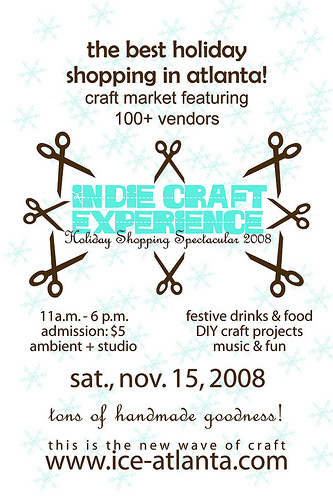 This entry was written by sistermissy, posted on October 28, 2008 at 6:29 pm, filed under Athens and tagged Athens, Atlanta, Indie Craft Experience. Bookmark the permalink. Follow any comments here with the RSS feed for this post. Post a comment or leave a trackback: Trackback URL.